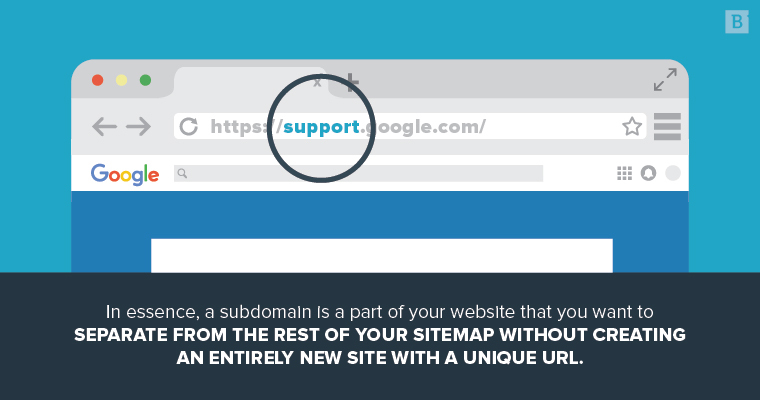 What is a subdomain and how does it impact SEO? Your website is a bit like an iceberg. People really only ever see the most visible portions – your homepage, blogs, product pages, etc. However, there is a much larger underbelly; a web of metadata, XML sitemaps, Schema markup, and site architecture that provide the framework generating a strong search presence. If you don’t want your search performance to go down like the Titanic, you need to account for these things. The guts of any website are a complex web of pages and subdomains, and the structure of those components is critical to SEO success. Google’s algorithms are infamously finicky, so you don’t want to go shifting around your site map without first understanding how these changes will impact your site’s ranking, especially when it comes to subdomains. A subdomain is a part of your website separate from the rest of your sitemap but without an entirely new or unique URL. That diagram is pretty clear-cut and easy to follow, right? But let’s say instead of a simple FAQ page, you want to build out an extensive research library filled with white papers, data sheets, training materials, user guides and product operation instructions. All of a sudden, that nice, neat sitemap would get very complicated, very fast. A subdomain lets you separate portions of your site that are extensive enough to warrant their own dedicated hierarchy without going through all of the trouble of setting up a new site or confusing visitors with a completely different root domain. Notice that it’s not https://google.com/support, but https://support.google.com. That ordering is critical to distinguishing a subdomain from a subfolder. Unlike a subdomain, a subfolder branches off from the top level domain in the site hierarchy. 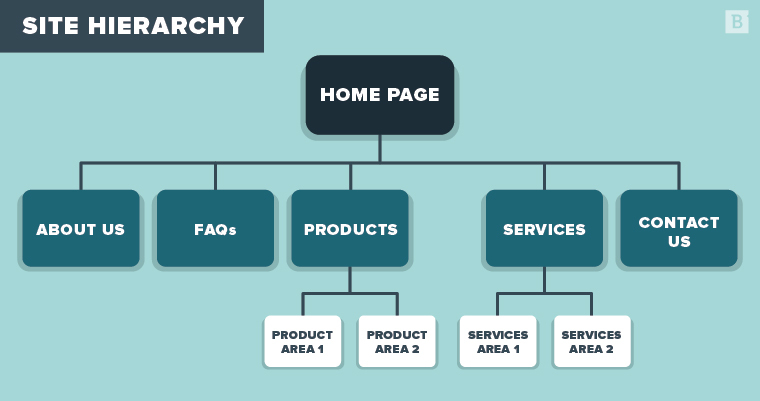 Site hierarchy best practices stress the importance of simplicity, recommending that organizations minimize the number of categories and subcategories included in any navigation sitemap. Kissmetrics, for instance, suggests keeping the number of site categories limited to anywhere from two to seven. When does it make sense to use subdomains? Given how extensive Google’s support page is, it’s a perfect candidate for subdomain status: There are a dozen apps to cover, each with unique troubleshooting articles and user guides. Subdomains are also pretty essential if your company operates in different international markets and you want to set up distinct websites geared toward certain countries and regions. If your German customers are forced to navigate the same website as your customers in North America (in English, mind you), that’s not going to lead to a great brand experience. In a similar fashion, subdomains are useful when you actually want to create a different brand experience for users. For instance, when companies have different products and services for both consumer and business audiences. Comcast Business is a great example of how subdomains support a better brand experience. Those services are specifically geared toward a B2B audience and are fairly extensive, so it wouldn’t make sense to bury that information somewhere in Comcast’s primary, consumer-focused site. The https://business.comcast.com/ subdomain allows Comcast to create two separate brand experiences for two very different target audiences. Companies may also use subdomains to set up mobile-focused variations of their main websites. Obviously, navigating a web page is very different on a smartphone or tablet than a desktop PC. Adaptive development processes dictate that developers account for different screen sizes and form factors when designing mobile websites. Creating a separate subdomain allows businesses to provide an intuitive user interface for both desktop and mobile site visitors. What are the SEO implications of subdomains? “So, it’s a good organizational tool,” you might be asking yourself, “but what does a subdomain have to do with SEO and organic rankings?” Excellent question. First of all, there’s really no such thing as organization for organization’s sake when it comes to site structure and hierarchy. A website that’s confusing to navigate due to poor structure is going to inevitably get dinged. A bad site layout will lead to visitors spending less time on your page or more time on page if it takes them a long time to find what they’re looking for, resulting in a less than satisfactory experience and potentially hurting your search performance. By using subdomains to streamline your site hierarchy, you help users find the information they seek more efficiently, improving your website’s SEO performance. There has been a lot of talk out there about the potential negative impact that subdomains can have on SEO performance. The reasoning goes that Google’s algorithms will recognize your subdomains as sites separate from your main domain, and rank them individually. They’ll essentially be stranded on little SEO islands, and your website won’t benefit from any positive impact your subdomain would otherwise provide if it were a subdirectory instead. Creating a separate subdomain allows businesses to provide an intuitive user interface for both desktop and mobile site visitors. Although the debate on subdomains’ SEO merits – or lack thereof – rages on, there’s reason to believe that previous warnings of “organic search cannibalization” may have been a tad overstated. According to Mueller, Google’s algorithms are pretty adept at crawling subdomains and subdirectories equally well and making sense of it all. That being said, he did caution against the use of wildcard subdomains designed to redirect anyone trying to access non-existent subdomains to a specific folder. Google’s algorithms have historically had difficulty crawling those specific kinds of subdomains. You’re probably hoping for a pretty cut-and-dry answer here, but there isn’t one. Like just about everything else related to SEO and Google ranking factors, you have to take things on a case-by-case basis. There’s no set rule dictating the use of subdomains because, for some companies, their benefits will outweigh any potential SEO fallout (either real or perceived). In other instances, subdomains won’t provide any real tangible value over subdirectories, so there’s no sense in making significant changes to the site structure. At the end of the day, it depends on what makes the most sense for your particular website. If you have any questions about your own navigation hierarchy and how to set up your website for optimal ranking opportunities, drop our consulting team a line. We can help identify the best approach to meet your goals and optimize your website. And once you have your site’s internal structure sorted out to perfection, you’ll be feeling pretty great – almost James Cameron great.